#NO2Booster My son loves to work out and wanted to give Research Verified NO2 Booster a try. I have to admit I was a little concerned, being mom, so I did my research. I found that this is a very safe product, and is manufactured under very strict guidelines, which really made my day. This is what I read about the manufacturing.. " Every Research Verified product must meet the following criteria: contain only the highest quality ingredients and the proper dosage and purity based on the clinical studies; manufactured in the USA in an FDA registered lab that is cGMP certified; contain no contaminants; all raw ingredients must be third party tested; the product must be certified by an industry leading quality control company such as QualityTrusted." I like knowing that any supplement my family takes is safe and made under strict guidelines. 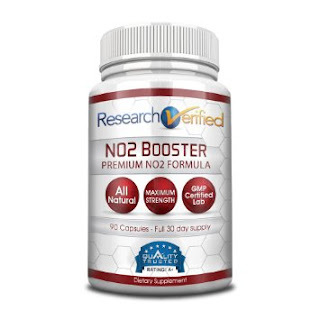 Research Verified NO2 Booster is 100% natural and promotes nitric oxide production,boosts testosterone,and adrenaline levels to enhance endurance and performance. My son says he takes 3 capsules about 30 minutes before his workout and he says he has so much more energy, but not jittery, and has far surpassed his old max. L-Arginine and L-Citulline which are known to help muscle growth. There's a 365 day no questions asked guarantee with this product, so you know this company has full confidence in it.